This is an extremely thorough, full 3-week (14 days!) unit for the short story/drama version of "The Diary of Anne Frank" by Frances Goodrich and Albert Hackett. These resources are focused around Common Core Standards for Grade 8, but they are absolutely still relevant for all middle grades students who are studying this story or drama genre in general. Please verify this by taking a look at the preview file. This is the Short Story of the Month Club, Grade 8: November Selection – Click here to read more about the Short Story of the Month Club! 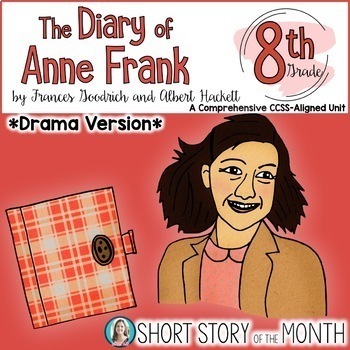 See the list of activities in the preview file for a COMPLETE list of all of the skills covered in this Diary of Anne Frank unit. Editable and digital (GOOGLE) versions included! Scroll to the bottom for details. This is a comprehensive, Common Core-Aligned Unit packed with a ton of rigorous resources for teaching with this short story. I’ve also included within the unit instructions for accessing this short story if you don’t have it. There are 4 assessments: Comprehension Quiz Act 1, (literal comprehension only), Comprehension Quiz Act 2, and a final Skills Test (both regular and modified versions included). It would take me forever to explain to you just how uniquely amazing this resource is, so go ahead and see for yourself. Download and view the complete unit for another short story, The Monkey's Paw, for free. I've also included complete instructions and standards alignments in the preview file so you can look as closely as you like at this unit before purchase. **Digital components included! ** All student pages are also included in Google Slides version so that students can access them and complete them digitally. 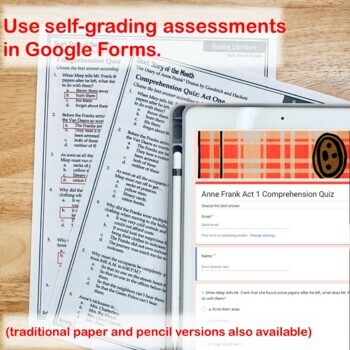 Both assessments (quizzes and test) are included in self-grading Google Forms versions. *EDITABLE* I have added my own original files in PowerPoint format for you to edit if you wish for your own classroom use. This only includes story-specific printables and I can't guarantee your ability to edit them based on your computer's settings and your tech knowledge. 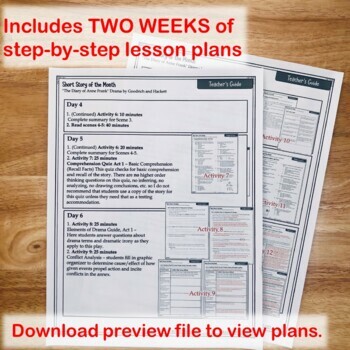 Bonus activities that have been included here as a courtesy to you (like interactive notebook lessons) will not include the editable versions - those editable versions are only available in the original resources. 3. November Selection – Available NOW – "A Christmas Carol" - drama version: Focus: Elements of a Drama, Trace the Development of Theme, Connotation vs. Denotation, Conflict: Man vs. Supernatural, Provide an Objective Summary, Compare Historical vs. Fictional Accounts, and more! Poetry Analysis, including: Sound Devices, Rhymes, Rhyme Schemes, Rhythm, Plot Analysis, Effects of Rhythm, Rhyme, and Sound Devices on Poem and/or Stanzas, Figurative Language. Also includes Close Reading/Annotation Guide, plus Complete 7-page Question-Answer flow. See individual item listing's preview file for samples. Focus: Characterization, Indirect Characterization, Classifying Characterization Examples, Character's Point of View (heavy on this one), Context Clues, Review of ALL grade 7 literature common core skills! 3. November Selection – Thank You Ma'am by Langston Hughes Focus: Characterization (Direct and Indirect), Character Traits, Theme, Comparing Similar Themes Among Genres, Finding Text Evidence, Paired Passages - poem by Hughes, memoir by Hughes, and excerpt from biography about Hughes, all with similar themes - Deep Analysis included!